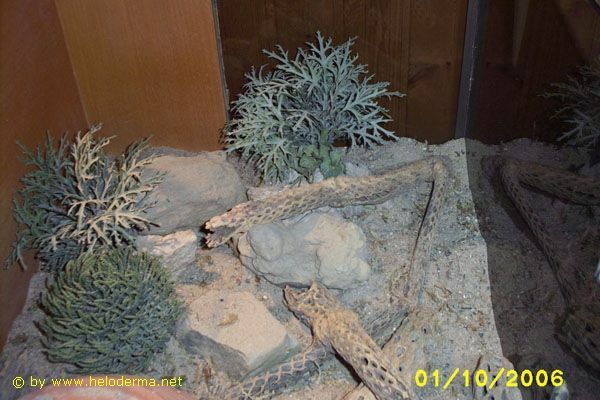 Keeping Heloderma is a serious task because they are venomous. 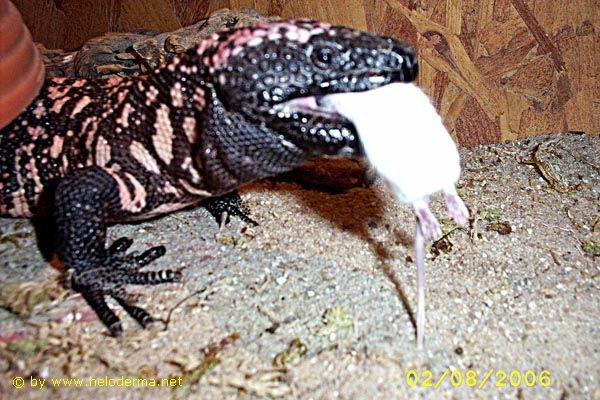 A bite can be life threatening. 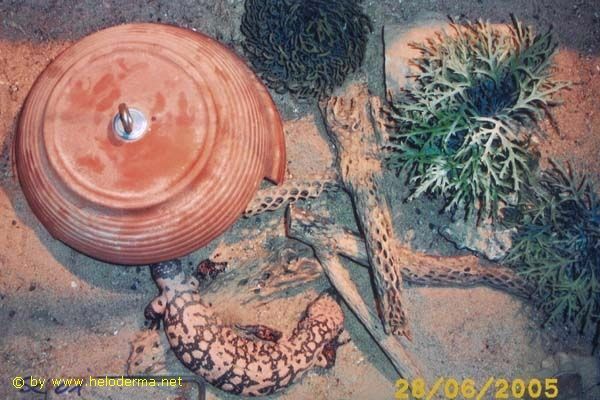 Adult Heloderma do not give problems to the experienced keeper. Some individuals have records of longevity of over 35 years in captivity. 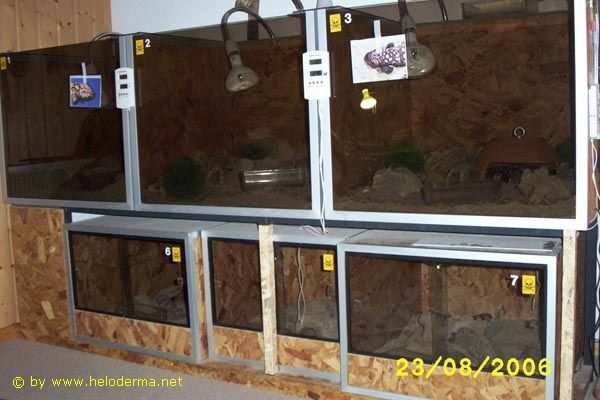 The enclosure should have a large scaled ground area to supply a temperature gradient from 22-32°C. 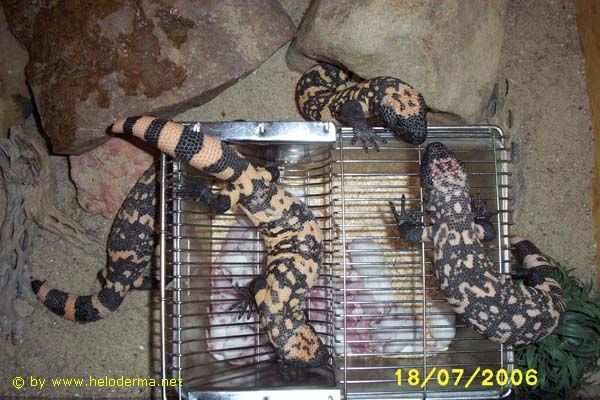 Starting in early November Gila Monsters should have the opportunity to hibernate at about 13°C on average. Hibernation should last until early March. 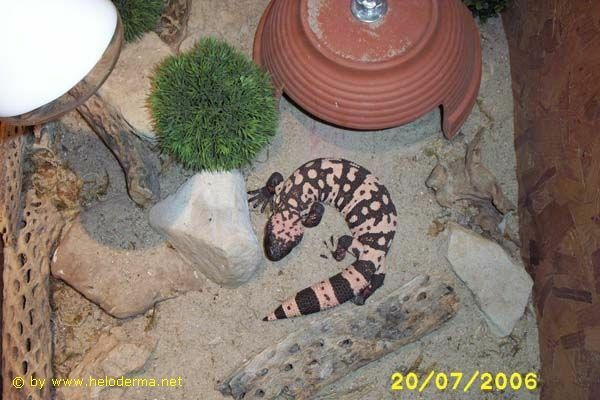 Out of my own experience, I suggest a ground cover with about 10 cm (ca. 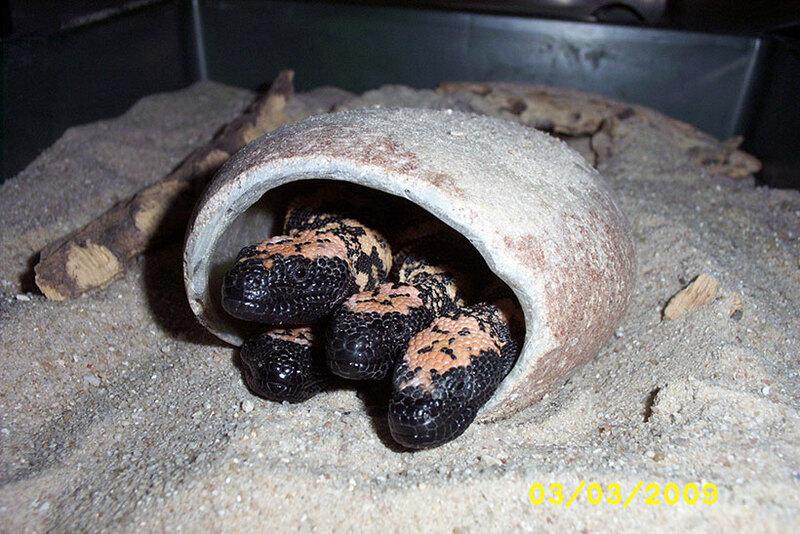 5 inches) of sand because Heloderma like to dig for hours and turn over their whole domicile. 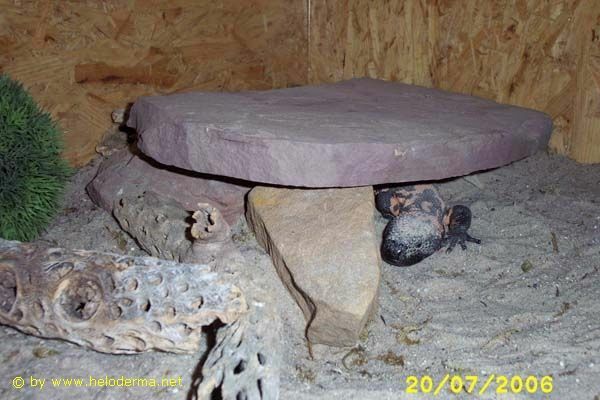 A housing on newspaper, bark, wood shavings or similar materials I consider not to be supportive for the demands of this species in captivity. 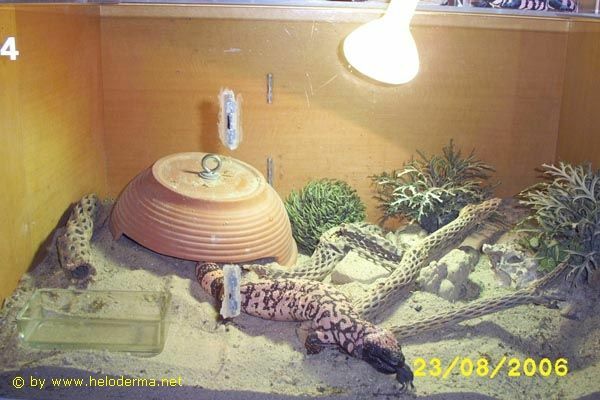 For further wellness of the kept I supply them with shelters, heating rock, UVB-Spotlight Megaray (USA) 100W, flat heavy water bowl and sand rocks to keep their claws at the right length. For decoration purposes, ball shaped plants are very useful as undestroyable "tumble weeds". 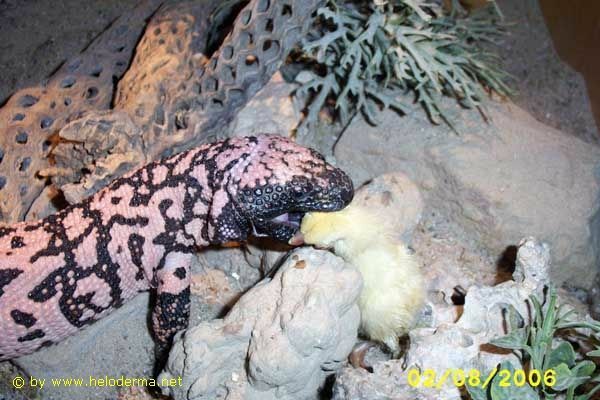 In their natural habitat Heloderma forages on small rodents, bird eggs, lizard eggs, and small birds (Ref. 1,2,33). 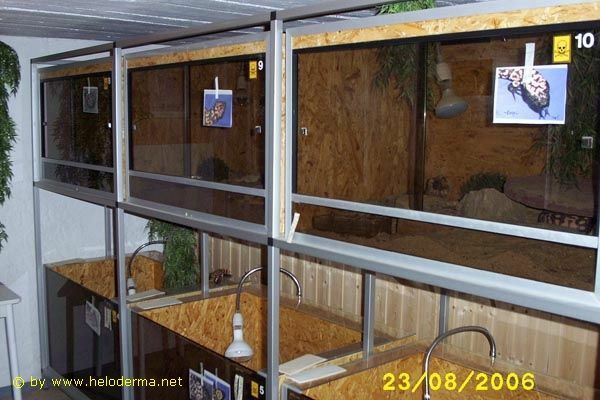 To fulfil these demands in captivity a similar variety in their menu should be offered: mice, young rats, one day chickens, eggs of small birds (e.g. quail) or chicken necks (fat cleaned off) etc. 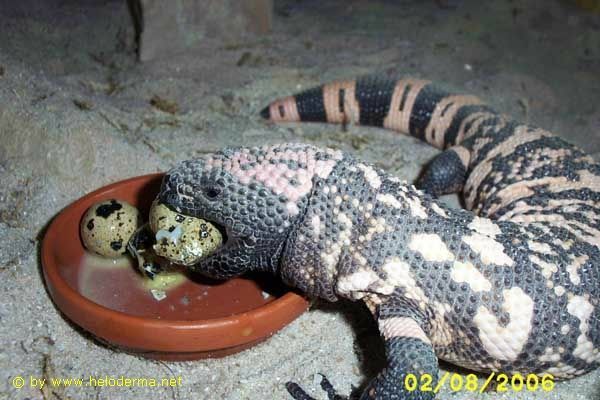 They also like to feed on lean raw meat supplemented with a little egg and sepia shell. Every four to five days a sufficient amount of fresh drinking water is necessary. 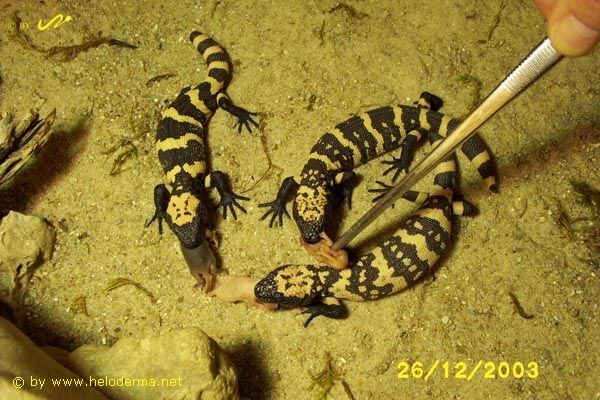 Suggestions for tank arrangement and food supply.